There is an abundance of features Nimble has to offer. Some of these are readily discoverable and intuitive, and some “hacks” you may not easily uncover on your own. In this post, you’ll learn from our Customer Success team about some of these more hidden gems, their favorite Nimble features, why CRM applications should be implemented into your day-to-day strategy, as well as an easy to follow workflow roadmap. 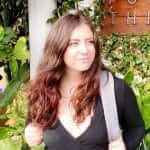 Meet our Customer Success Manager, Ionia. Ionia’s favorite feature is the Nimble Smart Contacts App. This feature is available for all of our customers whether they are on the Business Plan or Contact Plan. Say you’re communicating with a prospect via email, and you only know their name and email address. This information clearly doesn’t give you an idea of who this person is from a business and personal standpoint. By using the Nimble Smart Contacts App, you’re provided business and social insights about that person – complete with a brief bio, work experience, location, Kred score, influential topics, social interactions, and additional websites. All in all, the app delivers a 360-degree view of who you’re communicating with on a multitude of levels. Once you’ve gathered this information, you can then add the person to your Nimble database by simply selecting the “Add to Nimble” option. Adding the contact to your database will then enable you to strengthen the relationship with that person by setting follow up reminders, scheduling events, making quick notes, tracking sales opportunities, among other things — all without switching browser tabs. This truly amplifies our customer’s workflow by allowing them to spend more time focusing on growing better relationships. Next, meet Krystan, one of our Customer Success Ninjas here at Nimble. Krystan’s favorite Nimble feature is Smart Segmentation. 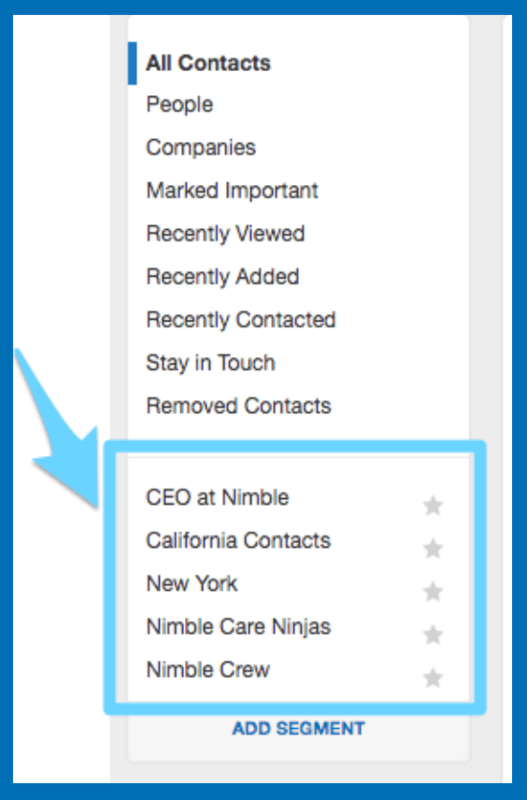 Nimble’s Smart Segmentation feature enables you to build targeted lists for your outreach (or other contact organization purposes) based on one or multiple criteria; this includes basic contact information, social networks, custom fields, tags, and more. 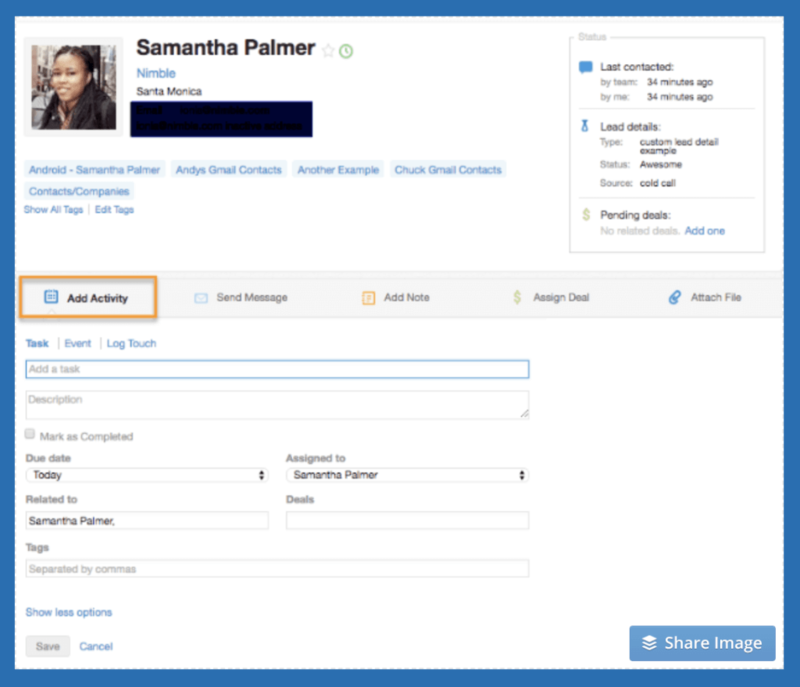 Using Segmentation for your contacts in Nimble gives you some automation with regards to your contact organization workflows in Nimble. Give your segments names and save them to your Contacts tab for easy access any time; there’s no need to build out the same search over and over again. Additionally, contacts are automatically added and removed from your saved segments when they meet or no longer meet the segment search criteria. When building your email outreach lists, be sure to add a filter to your segment for “Email is not empty.” Nimble will then exclude contacts that don’t have email addresses from your search results. Likewise, you can build a segment for contacts where “Email is empty,” “Phone is empty,” etc. to create a list of people to discover additional contact information for using the Nimble Prospector feature. The number of contacts in this saved segment will decrease as you fill in those fields on their records in Nimble. Our third Customer Success Ninja, Olivia, loves Nimble’s Multiple Custom Pipelines feature. This feature enables users to manage projects, campaigns, deals, sales pipelines, and more. With the Nimble Business Plan, users can create an unlimited amount of pipelines to manage their business opportunities. You can also customize the stages within your pipeline to reflect the sales process, updates, communication histories, and more. 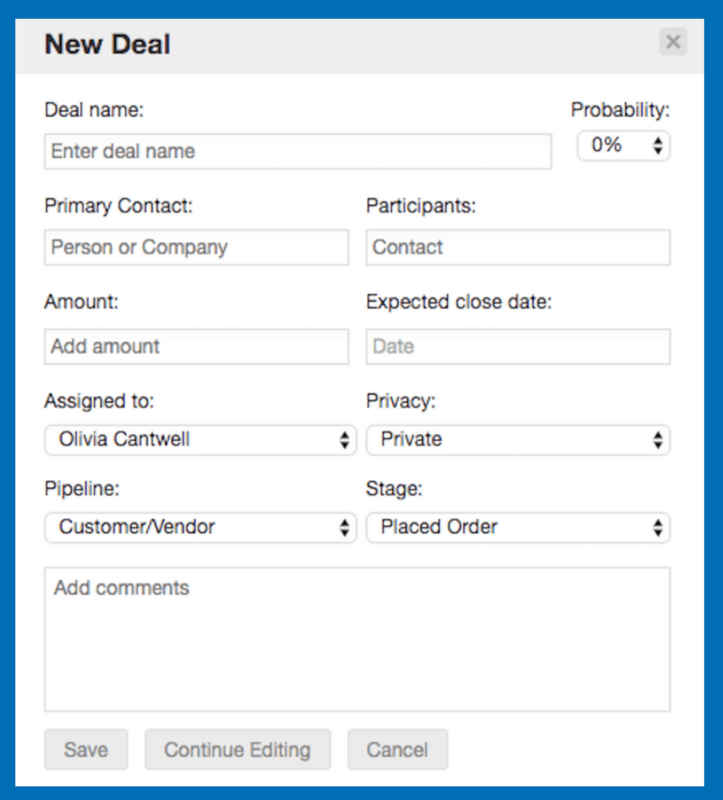 Within the Deal record, you will find fields for the Deals name, the probability of closing the deal, add a primary contact and participants to the deal, and more. Once you have created your deal within Nimble, you can then view your pipeline and what stages your deals are currently in. You can then easily manage your sales in order to identify areas for improvement, forecast the success of your outstanding deals, and close more sales. Last but not least, our newest Customer Success Ninja Marissa’s favorite Nimble hack is the Tasks feature. This feature helps you stay up to date by tracking your goals for the day, week, month, and year. 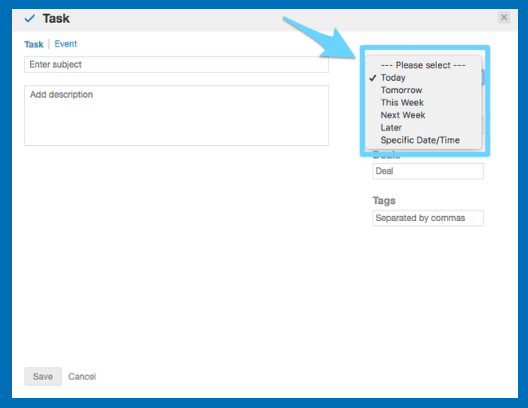 When creating a task, you have the ability to select a due date, relate it to a contact and deal, add tags, and assign it to a team member within your Nimble account. This feature also includes the Task Widget on the Today page. 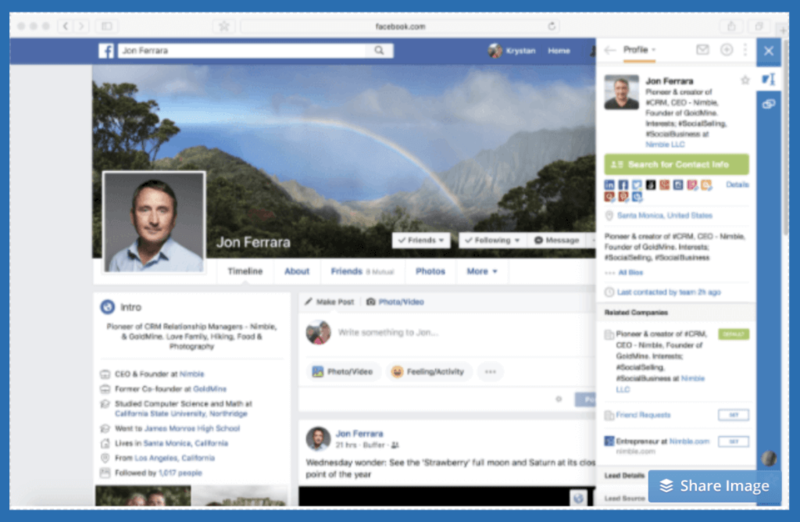 This feature enables users to quickly interact with your tasks by leaving a comment and completing it; the task will also appear on the person’s contact record. That way, you are not jumping back and forth between different tabs. 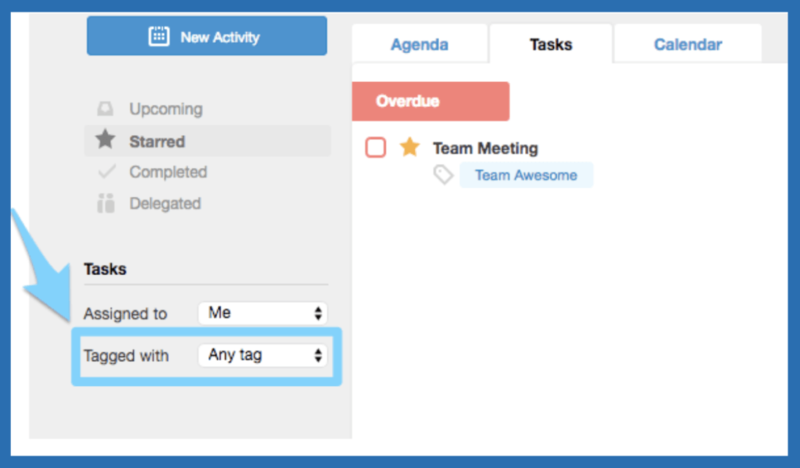 Take advantage of Task Tags. You can add a tag to your tasks, and Nimble will group related tasks together. This will help you quickly determine what tasks have been completed or still need to be addressed when reviewing your leads and deals. When creating tasks to follow up with key prospects, tag these tasks as “Follow-ups.” When viewing tasks associated with the tag, you can identify which team member the task is assigned to and its status. 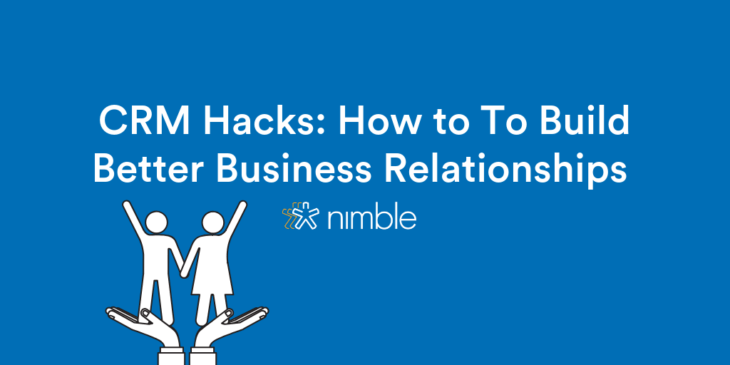 Although these are only a few of our Customer Success team’s favorite hacks, Nimble offers many more features that help make your life easier by building and managing relationships more effectively. If you need assistance implementing any of these tips and tricks, you can always reach out to our Customer Success team at care@nimble.com. We also hold on-boarding sessions Monday through Friday from 9:00 AM to 9:30 AM PDT/12:30 PM EDT. Feel free to sign up for a session and ask any questions you may have. What’s your favorite Nimble hack? Let us know on Twitter at @Nimble. Olivia is a Customer Success Ninja here at Nimble Inc. In her free time she enjoys traveling the world, eating, and catching up with friends on the local beaches with an iced tea in her hand. With a passion for Nimble, she assists users in managing their Nimble accounts and enjoys sharing tips, tricks, and workflows to best navigate Nimble for your business needs!